The melodious name of “Carrabelle” as it dances off the lips evokes imagery of a restful and serene place. At least it did for me the first time I heard of the small seaside town located on North Florida’s Forgotten Coast. Now many years later, just the sound of the name makes me smile. This small hamlet of simple splendor and beautiful name by contrast sidles herself right up next to a vast wilderness with the most formidable name of “Tate’s Hell.” Doesn’t exactly sound like an inviting place to venture, does it? Especially when you hear how the area got its name. Seems a fellow named Cebe Tate wandered lost for miles and days in the godforsaken swamp, lost his dog, lost his shotgun, eaten up by mosquitoes and bit by a snake. His reward when he finally crawls his way back to civilization? They say he dropped down dead right on the spot! But then names themselves don’t always paint the most accurate of pictures. Take for instance “Greenland” versus “Iceland.” Or the closer to home unappetizing sounding name of a dish called “grits.” Now I grew up in the “Sunshine City” of St. Petersburg where we definitely did not eat this food. In fact, I never even heard of grits until I moved to this part of North Florida and even then was not tempted to try them because I just couldn’t get past the name. That is, until the time I discovered fresh shrimp and garlic sidled right up next to grits laden with melted smoked Gouda cheese. Mmmmm…now that was a most unexpected Forgotten Coast delight! I have discovered there are many unexpected delights that dot the Forgotten Coast particularly around the area of Carrabelle. Places you could easily drive past without thought on a travel to St. George Island or Apalachicola. Little treasures like the friendly Carrabelle Junction featuring “Real Food for Real People” that steps back to the 1950’s with an old fashion soda fountain serving up cones, shakes, malts, sundaes, floats, egg creams and nostalgic soft drinks. 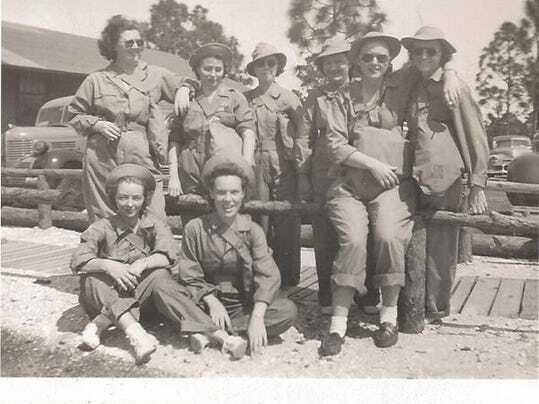 Or the incredible Camp Gordon Johnston World War II Museum that brings to life this historical period dedicated to the amphibious soldiers who trained here. Where you can wander in awe through 7,000 square feet of artifacts, photographs, locally produced film and exhibits on display. In the exhibit room of uniforms that line the walls, I swear you can actually feel the collective presence of the men and women who once wore them proudly, A word of caution - consider making this the last stop on your visit - because you might just leave filled hauntingly with emotion. A little further down Highway 98 is the Crooked River Lighthouse and Keeper's House Museum. Weather permitting you can climb the restored lighthouse on Saturdays and Sundays from 1:00 p.m. til 4:00 p.m. From atop the lighthouse are stunning views overlooking that place they call "Tate's Hell." It was my friend and fellow Certified Green Guide, Lesley Cox of Les Hassel Excursions who prompted my discovery of these unexpected delights of Carrabelle. Lesley has made her home here and enjoys showing off the area. It was Lesley who offered to take me on a venture into “Tate’s Hell” to reveal some hidden treasures of the forest. Since Lesley is a professional ecotour guide, Florida Master Naturalist and Florida Master Wildlife Conservationist who lives at the edge of this vast wilderness, I knew I was in safe hands as we set off on our tour. Lesley offers several tours within Tate’s Hell State Forest, an expansive 200,000 acre area of mostly wetlands – wet prairie, savannahs and wet flatwoods that work together to protect the fragile nearby Apalachicola Bay. The High Bluff Coastal Hiking Trail, four miles long with two trailheads is a moderate hike through scrub habitat, sand pines and relic dunes. The Ralph G. Kendrick Dwarf Cypress Boardwalk is well worth the 15 mile driving tour on logging roads to catch views of the unique “hat rack” small cypress trees from a bird’s eye vantage point. This enormous area was once a commercial forest, the native hydrology altered by manmade drainage ditches and roads. Today thankfully it is being restored; its longleaf pine forests and grassy savannahs reestablished. I was aware this area is home to a large population of Florida black bears, red-cockaded woodpeckers, bald eagles and gopher tortoise. Stay alert Lesley advises because along the way during our driving tour, chances will be good that a deer, bobcat, bear or wild turkey will cross the road in front of us. The fall migratory season is an especially good time to spot forest wildlife so I keep a watchful eye. As we bounce along on the bumpy dirt roads, Lesley talks about the dynamic nature of different ecosystems that exist here. She explains the history of the forest, and how it is currently being restored and managed through fire. The sounds of resident and migratory birds fill the air as we travel with open windows on this cool crisp day of autumn. Suddenly Lesley stops the truck and there alongside the road swaying in the light breeze are hundreds of colorful fall wildflowers with a show of equally colorful butterflies fluttering about. We get out and walk among this sea of yellows and purples as Lesley knowledgably identifies each one. We will witness much more fall color over the course of our half-day tour. Later we will travel on to a wet prairie savannah to see exotic carnivorous plants. 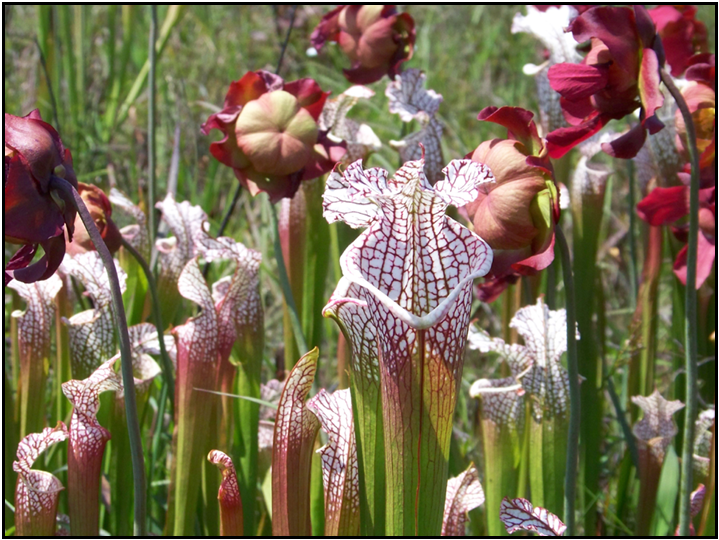 These amazing insect-eating plants include sundews, butterworts, bladderworts and several species of pitcher plants which lure and trap prey deep in their erect trumpet-shaped leaves. I did not know that Tate’s Hell State Forest supported such an incredible diverse variety of native wildflowers and grasses that put on particularly spectacular shows in both the spring and the fall. I did not realize the vital role these plants play in a wetland forest that directly impacts the marine conditions and estuaries of Apalachicola Bay. And I did not expect a trip to “hell” with Lesley Cox would be such a natural Forgotten Coast delight! Delight this fall especially during the month of October on a wildflower tour to “hell.” Restore and refresh your mind and body on a memorable guided tour through the natural habitats of Tate’s Hell State Forest. Driving tours, half-day walking tours, all day hikes or even overnight camping, Les Hassel Excursions can do all your planning so you can take in nature and enjoy the rich biodiversity of Florida at your chosen pace. Lesley also offers historic seaport tours of Carrabelle that include guided visits through area museums and historical sites including the “World’s Smallest Police Station.” She will also tell you how Carrabelle got its name. Explore Carrabelle with Lesley or schedule the Tate's Hell Hiking or Walking Tour this fall! Time has left the trail of the past and arrives at the doorstep of 2013. During this year fortune will smile on Florida as she celebrates a very special birthday marking 500 years of Spanish presence and influence that has shaped the heritage of our state. For it was in 1513 that Ponce de Leon and his small fleet of ships landed off the Atlantic Coast to mark the beginning of the longest recorded history ever of any American state. Columbus may have discovered the Americas in 1492, but European influence in Florida far predates the establishment of Jamestown, Virginia in 1602 and the arrival of the Pilgrims at Plymouth Rock in 1620. La Florida, “land of flowers” how fitting a name Ponce de Leon christened our state, dazzled by the vibrant blooming colors he saw set intensely against the glittering waters of the coast. Who knew we could slip so easily back into time the way we did that day? I had arrived at the Sopchoppy Depot one Saturday morning and settled myself on the steps facing Rose Avenue. From this vantage position I could watch the quaint rural town on the southwest edge of Wakulla County come to midmorning life. Now and then a pick-up truck rattled by, its occupants running leisurely the errands that waited for Saturday mornings. Next door shopkeeper Pat Bishop swept the porch of Posh Java in preparation of the day. The kitties-in-residence darted across the front lawn where soon Jack Simmons of Crescent Moon Organic Farm would set up with other vendors for the weekly grower’s market. Directly across the road I watched as a car pulled into the sandy parking lot of the Senior Citizen’s Thrift Store. A small dog leaps out as the car door opens and speeds like a bullet aimed deliberately in my direction across the quiet street. This little furry ball of energy lands squarely beside me, wags his lively tail and looks up eagerly for a scratch behind his ears. Now how could I refuse?